Treatise in the Mishnah and the Tosefta in the order Ṭohorot. The legal code of the Pentateuch prescribes a bath for lepers (Lev. xiv. 9) and for persons suffering from certain other diseases (ib. xv.). The bath, according to the rabbinical interpretation of Lev. xiv. 9, must hold at least forty seahs (= 268.29 liters), and must be of such a size that the person who is to be cleansed may immerse his whole body (Ḥag. 11a). The water may be from a spring or a river, or it may be rain-water, but it must not be drawn. The treatise Miḳwa'ot deals with a more exact definition of the rules upon these subjects. In most of the editions of the Mishnah as well as in the Tosefta this treatise is the sixth in the order Ṭohorot; but in the edition of the Babylonian Talmud it is the seventh, and in the editions of the Mishnah of 1559 and 1606 it stands first in this order. It is divided into ten chapters, containing seventy-one paragraphs in all. Ch. i.: There are six grades of bodies of water so far as cleansing and purification are concerned. The lowest in value is water from a pond, ditch, cistern, or cavern, as well as standing water which has flowed from a mountain. These waters, under certain circumstances, cause uncleanness, but they may, nevertheless, be lawfully used for washing the hands and also for making dough (§§ 1-5). Water still flowing from a mountain is a grade higher, for it can never become unclean; and it may therefore be used in preparing the priestly heave-offering of dough (§ 6). Next in ascending order is a body of water which contains forty seahs, and is therefore suitable for ritual baths and for the purification of vessels. Still higher in grade is a spring to which other water drawn from some source is added, and which in certain respects resembles a body of water and in others a spring (§ 7). A yet higher grade of water is that from a mineral spring, which cleanses even while flowing; and the highest of all is pure spring-water, which may also be used for the ritual sprinkling (§ 8; comp. Lev. xiv. 5-6, Num. xix. 17). Ch. ii. : When one has bathed and is uncertain whether he has performed the ceremony correctly, or when he is in doubt as to the size of the miḳweh, or when, on being measured, the bath is found to be of insufficient size, the person bathing is not considered clean (§§ 1-2). When drawn water renders the miḳweh unclean, even though it is doubtful whether it fell into the bath (§ 3). Three logs of water drawn intentionally render the miḳweh unfit, but if unintentionally drawn they do not have this effect, even though such water has been preserved in a vessel (§§ 4-9). Regulations concerning a miḳweh of water and clay, and the degree of fluidity of the clay which requires that the latter be taken into account (§ l0). Ch. iii. : Additional regulations concerning drawn water. How a miḳweh made unfit by drawn water may be rendered fit again (§§ 1-2). The method of reckoning drawn water derived from several vessels, and other methods of reckoning considered in connection therewith (§§ 3-4). Ch. iv. : How rain-water may be led into a miḳweh and not be considered drawn water (§§ 1-3). On the mixing of rain-water and drawn water before they reach the miḳweh (§ 4). Cases in which a conduit of stone is considered a vessel, so that the water in it is regarded as drawn water. Of the conduit of Jehu at Jerusalem (§ 5). Ch. v.: Cases in which a spring resembles a miḳweh, its water having cleansing properties when collected in a pool ("ashboran"), but not while it flows (§§ 1-3). Whether the sea may be considered a miḳweh and whether, even while flowing, it cleanses (§ 4). Flowing or dripping water, and what objects may be used to stop the flow (§ 5). Regarding a wave of the sea which contains forty seahs, and other bodies of water (§ 6). Ch. vi. : Of holes and rifts connected with a miḳweh (§ 1). Of dipping several objects at once (§ 2). Of reservoirs lying near one another (§ 3). 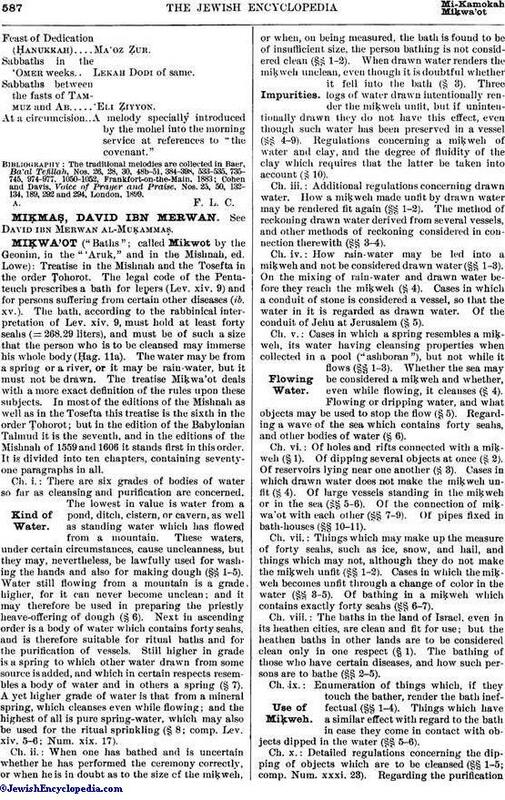 Cases in which drawn water does not make the miḳweh unfit (§ 4). Of large vessels standing in the miḳweh or in the sea (§§ 5-6). Of the connection of miḳwa'ot with each other (§§ 7-9). Of pipes fixed in bath-houses (§§ 10-11). Ch. vii. : Things which may make up the measure of forty seahs, such as ice, snow, and hail, and things which may not, although they do not make the miḳweh unfit (§§ 1-2). Cases in which the miḳweh becomes unfit through a change of color in the water (§§ 3-5). 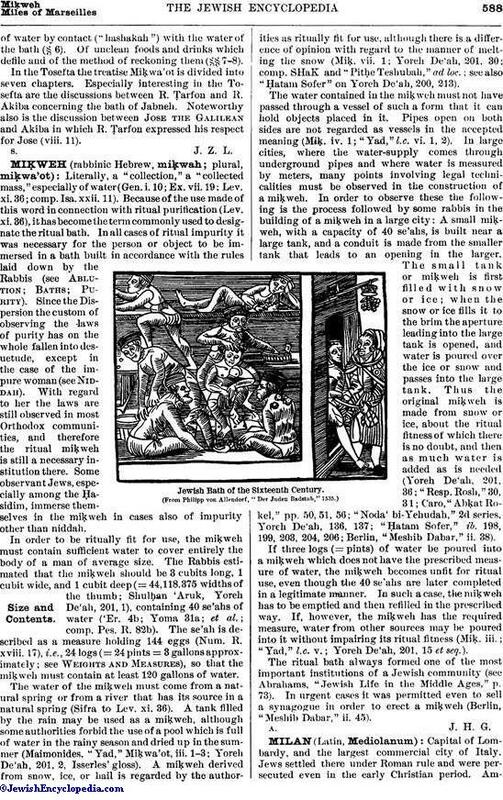 Of bathing in a miḳweh which contains exactly forty seahs (§§ 6-7). Ch. viii. : The baths in the land of Israel, even in its heathen cities, are clean and fit for use; but the heathen baths in other lands are to be considered clean only in one respect (§ 1). The bathing of those who have certain diseases, and how such persons are to bathe (§§ 2-5). Ch. ix. : Enumeration of things which, if they touch the bather, render the bath ineffectual (§§ 1-4). Things which have a similar effect with regard to the bath in case they come in contact with objects dipped in the water (§§ 5-6). Ch. x.: Detailed regulations concerning the dipping of objects which are to be cleansed (§§ 1-5; comp. Num. xxxi. 23). Regarding the purificationof water by contact ("hashakah") with the water of the bath (§ 6). Of unclean foods and drinks which defile and of the method of reckoning them (§§ 7-8).In the Tosefta the treatise Miḳwa'ot is divided into seven chapters. Especially interesting in the Tosefta are the discussions between R. Ṭarfon and R. Akiba concerning the bath of Jabneh. Noteworthy also is the discussion between Jose the Galilean and Akiba in which R. Ṭarfon expressed his respect for Jose (viii. 11).